The quote was attributed to Franklin Roosevelt, in 1939, when someone asked him about the wisdom of supporting Nicaraguan dictator Anastasio Somoza – who ran Nicaragua (with a 3 year interruption) from 1937 to 1956. And we have had an ongoing dilemma – between our interests and our ideals. What’s the threshold between supporting a less-than-democratic leader and abandoning them? We certainly wouldn’t support a regime like that in North Korea, with millions starving. A generation ago I can remember reading about the human-rights abuses of the Shah of Iran – but Iran was a lynch pin in our Middle East strategy. As far as I know Iran was the only country given the F14. And, that was because of a personal request of the Shah to President Nixon – a Soviet MiG (the mavF14d would probably know the exact nomenclature but I think it was a 24) – was making regular recon incursions and it took a Tomcat to shoot it down. It was said (primarily by those of the Left in the West) that the supporters of the Ayatollah Khomeini were “democratic reformers”. Think of the consequences to the West in sponsored terrorism after a generation of these democratic reformers. How much could we have influenced? And should we be trying to influence outcomes in key countries (we aren’t talking about truly democratic countries but 1 dictator vs another). I don’t have the answers – but know the consequences are far reaching for whatever we do. Will we be talking about the consequences of the Egyptian Revolution a generation from now? It was Anwar Sadat who gave a generation of peace between Egypt and Israel. Hosni Mubarak was his Vice President and in the same stands when Sadat was assassinated. Like the Shah a generation earlier, Mubarak was “thrown under the bus” by the current administration. Could a more active support have made a difference? I don’t have the answer, but the effects of this revolution are not yet evident. While this has been on my mind for a long time, a discussion Bill O’Reilly had with Brit Hume last night prompted this post – about Hamid Karzai, the head of Afghanistan. A lot of brave Americans have died or been maimed fighting this war, to keep out the Taliban and a base for al Queda out. And we are giving the head of Afghanistan backpacks of cash to remain “our friend”? Aerial delivery tests, as part of further operational demonstrations were conducted at China Lake, CA using dummies for static-line drop tests. Cargo drops with 5000lb to 20,000lb were also conducted from an altitude of about 4750ft. The heaviest drop was a 28,243lb load of CDS containers. The primary result of the drop tests found the troop door was too narrow. 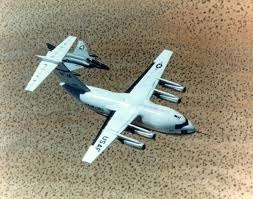 The YC-15 also tested mid air refueling as both a tanker and receiver in May-June 1976. 102 hookups were made with a KC-135. Fuel transfer to the receiver was found to be slow (partly because the UARRSI was not designed for the aircraft). Trails of the YC-15 potential tanker aircraft used Navy and Marine Corps aircraft fly a position slightly below and behind the aircraft to simulate the probe-and-drogue method of aerial refueling. 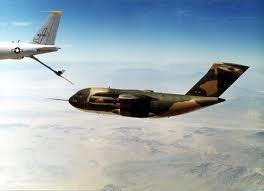 One of the YC-15 aircraft receives fuel from a USAF KC-135. On 15 to 17 December 1975 YC-15 876 tested ground loading of Army vehicles. 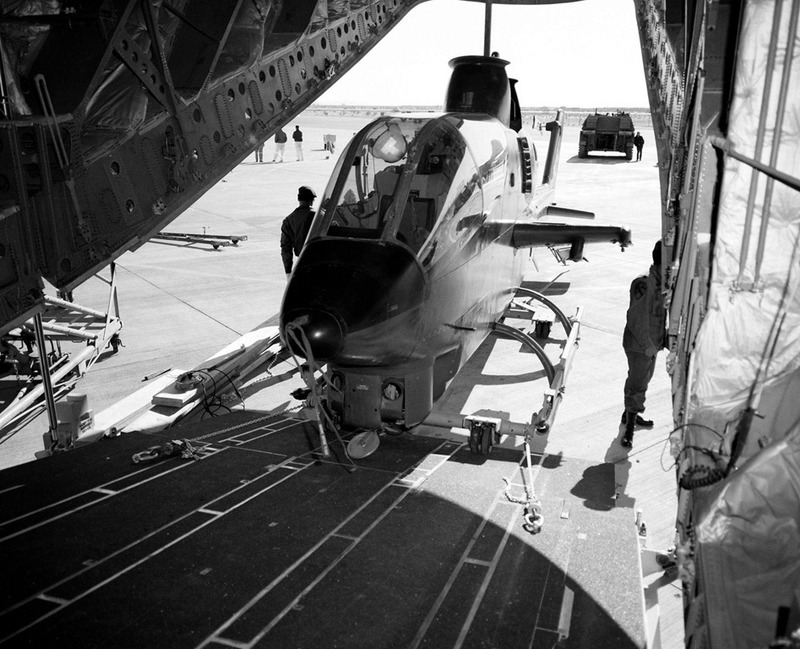 An AH-1 Cobra being loading aboard a YC-15. 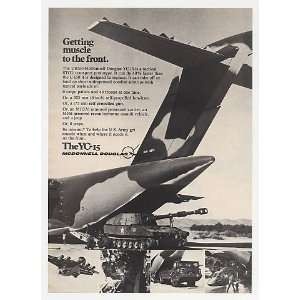 A McDonnell Douglas advertisement for the YC-15 showing an M-109 at the rear cargo door. Overall the YC-15 was found to be a good airplane but had marginal maintainability. 2 of the biggest issues were was engine maintenance and the flight control system. Naturally the YC-15 was going to have maintenance issues because it, like all research aircraft, was intended to test technology and not necessarily representative of an optimized “production-type” aircraft (I remind the reader to a look at the differences between the YF-22 and F-22). Phase 1 tests ended in 18 August 1976. By then both aircraft accumulated 226 flights over 472.8 hours. The YC-15 demonstrated an ability to fly as slow as 62kt to a fast as Mach .78. The initial phases of flight test validates EBF as a valid solution to the STOL problem. 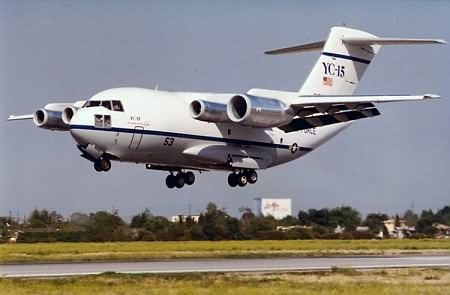 Phase II of the AMST program for the YC-15 began on 7 September 1976. Both aircraft underwent a number of modifications including having a CFM-56 turbofan engine installed on the #4 engine pylon. The wingspan was extended by 22.3ft as a result the wing area went from 367ft2 to 2107ft2! A fighter-type stick was also installed. Previously shown picture of the YC-15 showing the installed CFM-56 engine on the #4 engine pylon. On the software side, aircraft 876 had a number of modifications installed including a thrust management system (required because of the increased thrust of the CFM-56) (TMS), an Engine Failure Detection System (EFDS), a digital SCAS and the VAM was improved with a flight director indicator. Phase 2 testing resumed 12 February 1977 and resulted in 49 sorties for 125.6 flight hours. 876 also went on a tour to NATO member nations in Europe. In Phase III testing aircraft 875 was returned to original configuration but had a Gross Weight Selector (GWS). The GWS would calculate the optimum flap angle for a given gross weight at various flight conditions. The DLC was improved to operated with and engine out on final approach. All these modifications (including the increased aspect ratio of the wing) resulted in a 10kt reduction in approach speed. The final tally for Phase III testing included 416 flights over 796.3 hours total for both aircraft. By February 1978 both YC-15s were placed into storage at Edwards AFB. 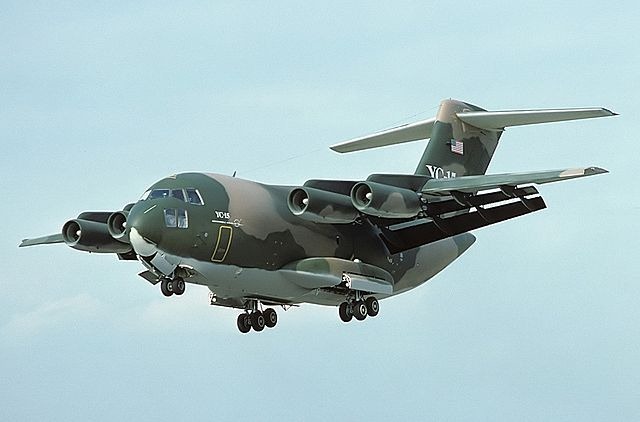 Part IV will detail the technological contributions the YC-15 made to the C-17 program and the return to flight of the YC-15 in support of that program. Cross posted at Bring the Heat, Bring the Stupid. *[UPDATE]: For reader that may not know, direct lift control (DLC) is a system of spoilers, located on the upper surface of the wing. that either differentially control roll and in unison control pitch by dumping lift from the wings. They are common to most airliners. It’s funny – next year will mark the 40th year since I was discharged from Ft Jackson, SC. And having the advantage (and, as I have grown older, a realization), the gift, of old age, I am putting things in perspective. At the time, I thought WW2 was ancient history. But it had ended only 28 years earlier from my arrival. During the Cold War, service in Germany was primarily an Army/Air Force thing – at the time, close to 400,000 served there. Now there is but a handful. The Army, after the war, took over the posts (caserns) that the Wehrmacht had. I don’t think anyone thought, in 1945, that they would have been there for as long as they were. While going into the Army wasn’t my initial idea (and like Busbob’s remembrance of of George Jones, this Command Sgt Major’s retirement kind of shook me up – he was drafted in the same group as me – Sep 72 – the 2nd to the last group – my Army time to me is one of the highlights of my life – even as a lowly Spec/4 (that is E4 to the rest of you). There isn’t a day that goes by that I don’t miss the camaraderie. I thought you would like to see a few of these pictures. By the way, the way I got to Germany was a bit odd – at my school at Ft Bliss, TX, all of the graduation class from “E”s to the “Z”‘s were sent to the DMZ in Korea, manning Army Air Defense facilities. There were 5 of us in bureaucratic limbo. Three of us didn’t care where we would be assigned, we just wanted an assignment. So we bugged this civilian bureaucrat on base every day. Which, I’ll admit, was a pretty nice assignment. 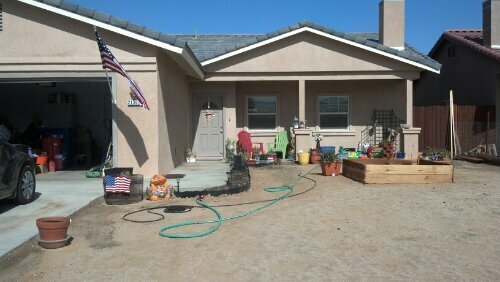 The remaining 2 stayed at Ft Bliss doing who-knows-what. 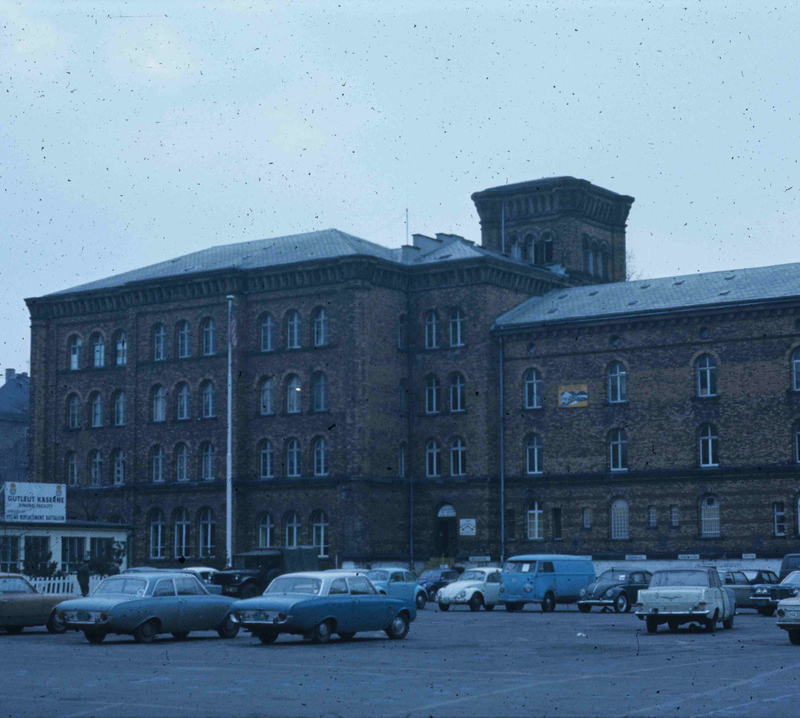 While I was in Army Air Defense, I didn’t know where I would be stationed until a couple of days later – Got on a chartered bus and headed down the Autobahn to Kaiserslatern (called K-Town by the GIs) – at the Kleber Kaserne. 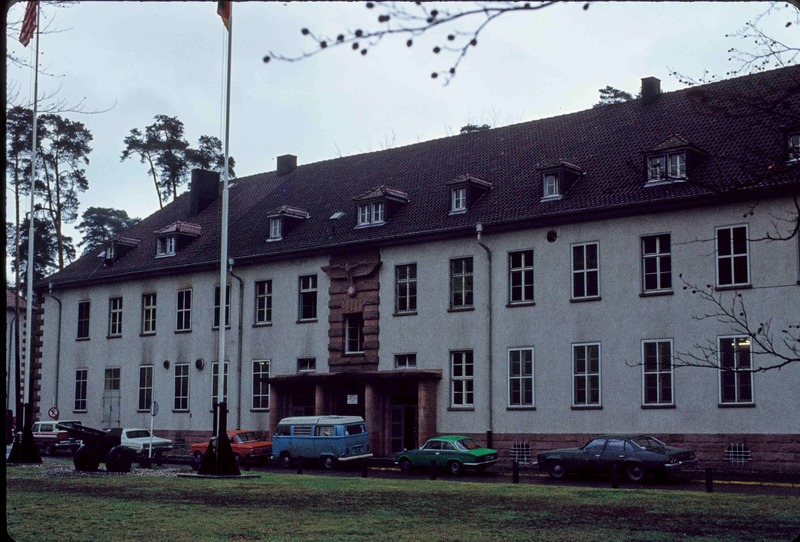 My first station was at an old radar station overlooking Ramstein AFB – my barracks were up a hill in Landstuhl – 5-7 miles away – site of the premier military hospital – but the barracks were an old Luftwaffe barracks built to last the “1000 year Reich ” – only the designers didn’t expect the foundation to crumble 28 years later. Built to house 100s, there were about 20-30 of us here. The real action as far as my MOS was concerned, was a mini-NORAD type bunker about 50-60 miles northwest. Code-named Lima, it was one of 3 such bunkers in Germany. It was staffed by an equal number of US Air Force and German Luftwaffe, and about 20 of us Army types. (The Air Force, for some strange reason, always wants to keep an eye on us Army Air Defense types in case the ground to air missiles go up 😉 ) I volunteered to go there a few months later. We would take an Air Force bus up at the start of a 24 hour shift and by the end – living in near darkness for 24 hours, I felt like a gopher coming back up – No pictures allowed there, but it was perfectly camouflaged from the top – guarded by the Germans. (who, naturally, were amused by my last name which happened to be the same name as the then-chancellor). I went back there in 1992, and a young German guard said that it was scheduled to be closed. 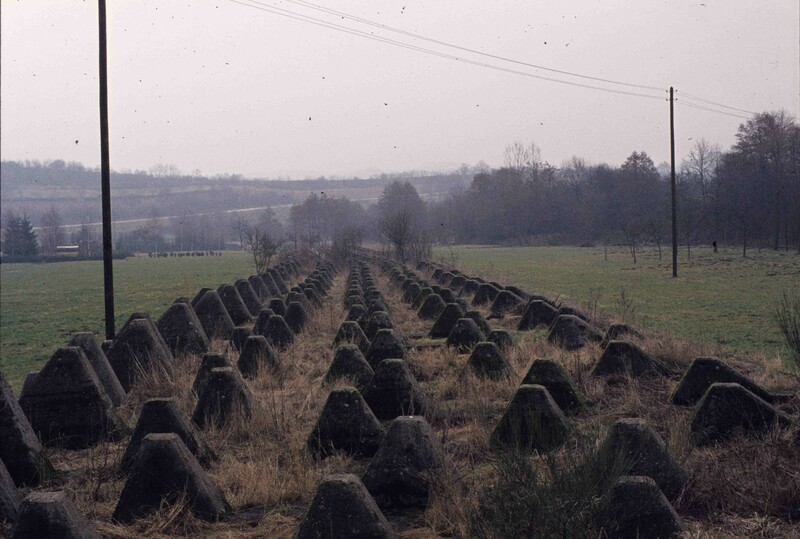 With the benefit of time I have realized that the war wasn’t that distant at the time – here’s a picture of the remnants of the Siegfried Line – Germany’s answer to France’s Maginot Line – during the closing months of the war, Patton just ran around it I believe. I did some puttering today. I first heard this George Jones tune in a fraternity brother’s room. It was the late 60’s and country music was not “in” the way it is today. The Rolling Stones, the Mamas and the Papas, the Beatles, the Monkees, and many other pop groups took first place in the music world. Don’t know why the lyrics to George’s song stayed with me all these years. I can still picture my fraternity brother’s room on the campus, it was never a bastion of neatness. Drew was never a bastion of anything but party on, brother. His focus in life was golf and beer. Or was it beer and golf? Maybe that’s why George Jones’ death brought back thoughts about life and what it brings to us, and what it doesn’t bring. George lived a life that was out of control at times. Drew was the same, and he beat George to the finish line. Drew was an alcoholic. Took me three tries with the spell checker to get that word right. I didn’t know he was one, most everybody in our fraternity would not know the difference between an alkie and an average college kid in the 60’s. We partied, partied a lot, drank heavily. Most of us saved the party part until the weekends. Drew didn’t. Anytime after noon or so you could find Drew in his room, an open beer bottle on the desk and George Jones records lettin’ loose tune after tune on the stereo. The door was always open, there was always a beer in the fridge. George and Drew had something in common. Booze and a life out of control at times. The story of Drew driving home for a holiday once was legendary. He was pulled over for erratic driving, turns out he had consumed more than a few of the beers in the case he bought before leaving school to go home. The sheriff bluntly told him he’d been drinking. Drew’s candid response (“No #$%*, sheriff!”) caught the sheriff by surprise, so much so that the sheriff didn’t give him a ticket but instead escorted Drew all the way into the next county. Home. Could it be that our generation was faced with Viet Nam and the implications that falling out of college meant in those days? Flunk out, lose the college deferment, go to the front of the line for service in ‘Nam. Not a popular war, not a popular topic amongst the college crowd, and a source of fear to many. Could it be that the pressure was there to perform, keep the grades on the passing side, keep the army out of the picture, no matter what? Was that the reason for the liquid dependence? Or could it be that just the pressure of life was too much for some? Maybe for Drew? I don’t know. Lost track of him after college, only to have his name come up one day 40 years or so later, when a friend of ours mentioned they were from a small town in Texas. Drew’s home town. Where? I asked, I have a fraternity brother from there, did you know Drew? Yes, same high school class, was the response, followed by did you know about him and his life? No, what happened, I asked. Maybe I shouldn’t have asked, the story was tragic. Too much alcohol, lost jobs, a stint as high school coach, a bank robbery, or maybe it was just an attempt, prison time, a lost and dissolute life, a wreckage of a family, and finally a lonely death on a New Year’s Eve a decade ago. His death went unnoticed for days, no one went looking for him. I passed the news on to my fraternity brothers five years after his death and not one of them knew of his passing on. Most of us go in one direction, our lives are predictable, we don’t know or understand what hurts inside others and makes life misfire. I wonder what demons turned Drew down the wrong road. George Jones’ death made me think of Drew again. … in that the majority of us already read The Duffel Blog. But here’s a sample, just in case the blog is new to you. MINNEAPOLIS, MN – Officials from the Minnesota Department of Motor Vehicles have confirmed approval of a new policy making it mandatory for all active-duty and military veterans to register their status with the agency. The move will require all veterans to have a special “Vet” designation on their drivers’ licenses and state identification cards. The new strategy will most likely result in changed police escalation-of-force procedure when dealing with veterans during routine traffic stops. According to Olson, law enforcement officers will be given more opportunity to defend themselves against a perceived threat. RTWT. The WSJ, among others*, have praised the Duffel Blog’s satire as cutting edge, and it most certainly IS.